Our cheery, open cafe dining/kitchen area compliments the entire breakfast experience. Each morning guests staying in our B&B can witness their food being prepared and even have a chance to converse with the “chef!” We prepare an artisan, locally sourced, home-cooked sit-down breakfast served at 9:00 am. Our seasonal breakfast offerings are served Omakase style “chefs choice” and carefully selected to enhance your experience. 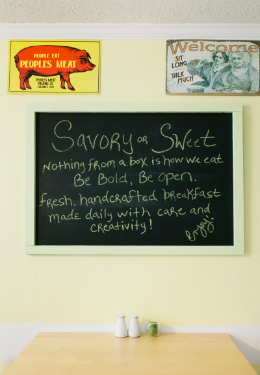 “Savory or Sweet – nothing from a box is how we eat – Be bold, Be open” is our motto as we share our culinary delights with you. Please keep in mind that our B&B has a home kitchen to create the breakfast magic so it is very important for us to plan for any food allergies and/or dietary restrictions in advance. Reservations MUST include any food allergies and/or dietary restrictions with a 48 hour notice prior to arrival. Without reasonable notice of dietary issues, we predict a high level of food envy courtesy of other diners. Please feel free to contact us to discuss how we can better prepare for your visit. Curious about what you will experience? All of our eggs, sausage, and many other seasonal, epicurean delights are sourced locally in Wilmington from Humble Roots Farm. Take a gander at a few culinary splendors, but in the spirit of Omakase style, the element of surprise can also be the best part of your adventure. Starter Palate Cleanser: Mango / almond smoothie bowl with toasted coconut and raspberries accompanied by fresh fruit and homemade banana walnut bread. A Sweet Breakfast Day: Mini German pancake soufflés served with an apple-calvados caramel sauce with Dijon maple glazed bacon. A Savory Breakfast Day: Leek / garlic crust-less quiche topped with lemon ricotta and rocket accompanied by seasonal herb skillet potatoes and country sausage. Important Note: Due to health code, we are only able to serve breakfast to our guests staying in our Bed & Breakfast. Sorry beach vacation cottage rental visitors, it is not our intention to exclude you! It’s all about the bean! As coffee lovers ourselves, we will not let you down. 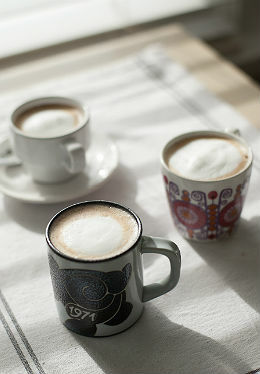 We offer exclusive gourmet blends provided by Carolina Coffee Company (a local artisan micro-roaster in Wilmington). Early morning coffee starts at 7:30 am and we keep pouring at breakfast until you have had enough to get you through the day. We sell what we serve so you may also take home a “Taste of the Beacon House.” A gourmet selection of hot teas is also available if coffee is not your thing. Food and coffee are our passion and we are eager to share our good eats with our guests.